BULK 12 PACK of charming vintage mercury glass tealight holders. 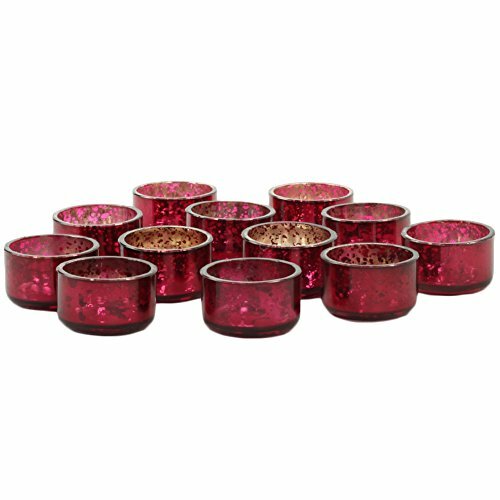 This ideal pack size is perfect to scatter across each table for candle decor. MERCURY GLASS INSPIRED. Burgundy foil on glass candle holder. Not made of plastic. Light reflects beautifully off the metallic red. Rental quality, re-usable and practical also great for vintage home decor. STANDARD TEALIGHT CANDLES. Our antique finish tea light holders fit a standard tealight in metal cup and standard tea lights in plastic cup. Quick, easy clean up! Simply replace the tea light cup once empty with a new tea light cup. MINI CANDLE HOLDER SIZE. Each vintage tealight holder measures 2 inch Diameter x 1.1 inch Height. Pair with our tealight unscented candles in metal cup for a 6 Hour Burn B01CYXQACC (Sold Separately) or our tealight candle unscented in clear plastic cup for a 4 Hour Burn B01CYXQ8Z6 (Sold Separately). CENTERPIECE IDEAS: Use as your dining table centerpiece, centerpiece wood slabs, Moroccan decor, beach home decor, centerpiece table mirror, backyard decor, Bali garden, outdoor decor, patio decor, Bohemian decor, candle Quince ideas, candle Zen garden ideas and more.